BROWN-Creepy Sneaky Snake Light-up Halloween party prop decoration. This scary snake will make a very cool prop for your haunted house or home haunt. Spooky realistic color with eerie blood red lighted demon eyes making for a piercing effect. Uses 3-AG13 watch batteries, NOT included. Approx 40-inch long x 2-inch (100x5cm) diameter. Recommended for indoor or covered porch use only. 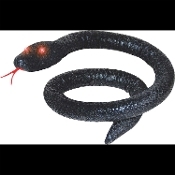 BLACK-Creepy Sneaky Snake Light-up Halloween party prop decoration. This scary snake will make a very cool prop for your haunted house or home haunt. Spooky realistic color with eerie blood red lighted demon eyes making for a piercing effect. Uses 3-AG13 watch batteries, NOT included. Approx 40-inch long x 2-inch (100x5cm) diameter. Recommended for indoor or covered porch use only.